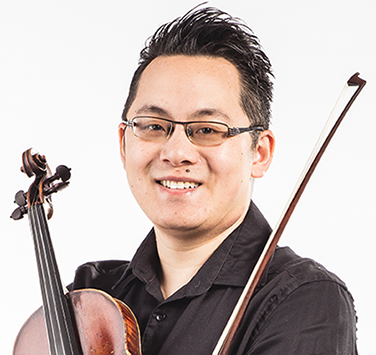 Halifax-born violinist Mark Lee studied at the Dalhousie University with Philippe Djokic. Following his graduation in 2010, he pursued his postgraduate studies at the Royal Academy of Music with Lydia Mordkovitch and Maureen Smith as a Leverhulme Scholar. In addition to his teachers at the Royal Academy, he has also received private studies with Maxim Vengerov. Mr. Lee is the recipient of numerous awards and scholarships that include the first Georg Tintner Scholarship Award, a solo debut with Symphony Nova Scotia in February 2010, the London Symphony Orchestra String Experience Scheme, Wolfe Wolfinsohn String Quartet Prize (both in 2011 and 2014), Max Pirani Piano Trio Prize, and the Regency Award recommended by RAM for notable achievement. After receiving his Masters degree at the Royal Academy of Music with the highest distinction, Mr. Lee worked closely with the London Symphony Orchestra, and with the Royal Philharmonic Orchestra as acting Principal Violinist. He has made recordings with the Royal Philharmonic Orchestra, and has toured extensively throughout Europe, Russia, and Asia. He has also performed for members of the British Royal Family in the House of Lords Parliament. Mr. Lee is a member of the Verbier Music Festival Orchestra serving as concertmaster under many renowned conductors including Charles Dutoit, Yuri Temirkanov, Daniel Harding, Jaap van Zweden, Ivan Fischer, Esa-Pekka Salonen, Gianandrea Noseda, Valery Gergiev, Manfred Honeck, and Zubin Mehta. As a chamber musician, Mr. Lee has performed extensively across Europe. His performances have been radio broadcasted live across the UK and Scandinavia. He has worked with several established chamber ensembles such as the BBC Scottish Ensemble, the RTÉ Vanbrugh Quartet, the Maggini Quartet, the Endellion Quartet, the Ying Quartet, and the Escher Quartet.